I’ve been cooking less these days, actually almost none. I rely on circumstances to provide for me, as Mitja is away on a business trip. It kind of feels like a mini holiday, not having to cook or do the dishes. On Tuesday I had the good luck to be offered a lunch of delicious barley soup and leftovers for the next day. I made a cabbage salad with minimum cooking (just a couple of potatoes). Today I got chinese that served as lunch and dinner. My friend also gifted me some freshly picked dandelion greens that will serve as lunch tomorrow. I feel blessed. 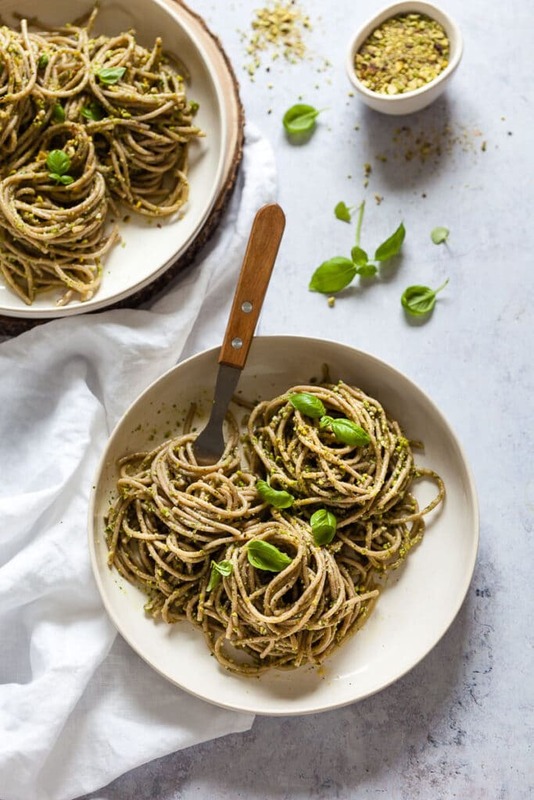 It’s on days like these that a recipe like this Vegan Green Pesto Pasta comes in handy, as it requires almost no cooking and just 20 minutes altogether. 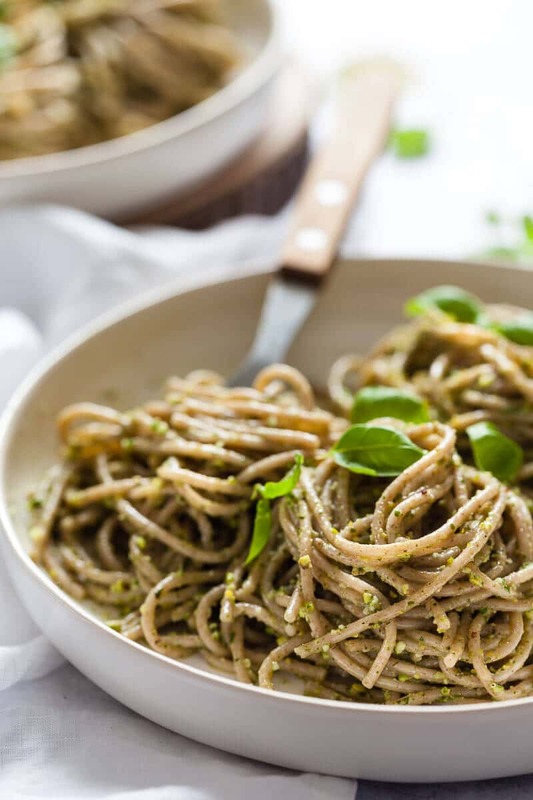 Just boil a pot of water, cook the spaghetti (takes literally 10 minutes), toss pesto ingredients in a food processor, blend and toss the pesto with the pasta! And you’re done! A delicious plant-based meal ready to enjoy in less than 20 minutes! 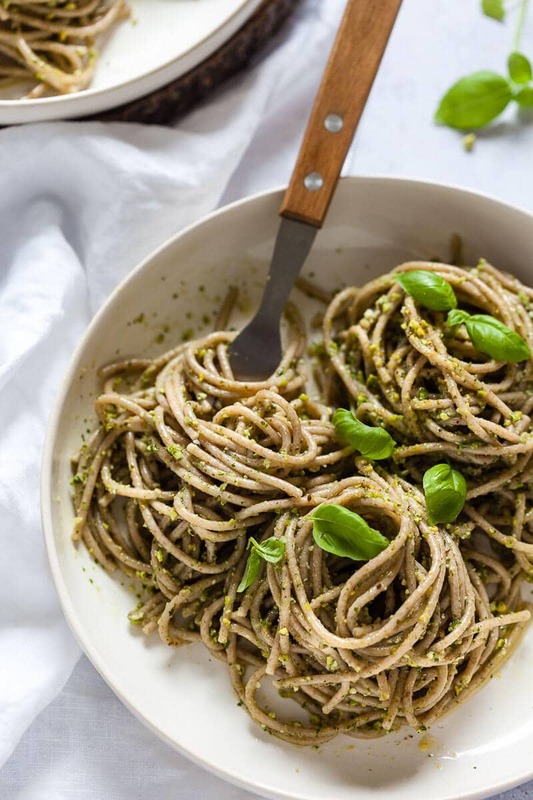 For this Vegan Green Pesto Pasta, we decided to combine pistachios with a mix of basil and baby spinach, just because we find the pure basil taste overwhelmingly strong. Using baby spinach instead of half the basil worked perfectly, providing with a more delicate pesto taste with a wonderful hint of pistachios. We recommend choosing carefully your olive oil base, as some olive oils can be strong and spicy. So be sure to give it a taste before blending the pesto! If your olive oil is too strong, try adding some more vegan cream cheese to cut the strong taste. And now we’re off, having another forkful of this tasty Vegan Green Pesto Pasta. This recipe is sponsored by Hofer Slovenija (you may also know it as Aldi). Head over to Hofer’s Instagram account for even more delicious recipes. In a large pot, add water, season with salt and bring to a boil. Add wholewheat spaghetti and cook al dente according to package instructions, about 10 minutes. 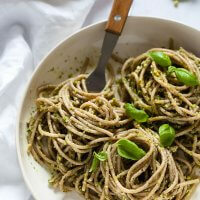 Prepare the pesto: to a food processor add olive oil, shelled and unsalted pistachios, basil, baby spinach, vegan cream cheese and grated vegan parmesan. Blend until smooth. Season with salt and pepper to taste. 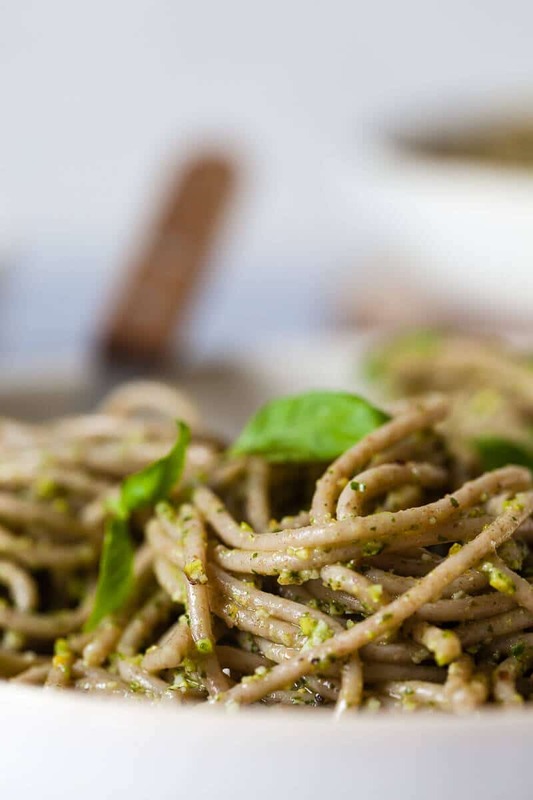 Drain the cooked spaghetti, toss with the vegan green pesto and serve. If you’re looking for easy pasta recipes, we have more!